Plant used to produce magnesium castings with the low pressure gravity die casting process. (Fig. 1, Ing. Rauch Fertigungstechnik GmbH) as the conventional low pressure gravity die casting process with gas pressurization (e.g. for aluminum alloys) is not very suitable for magnesium. The pump is controlled via pressure or time measurement so that the mold can be filled in the desired way - also with different filling speeds. The pump can be stopped immediately with an emergency shut-off function or due to fault detectors which prevents the liquid magnesium from being ejected or leaking. The melt in the crucible and the (shielding) gas compartment above it do not have to be pressure-tight. This means that the seals for openings used for cleaning and loading which are difficult to handle and maintain are unnecessary. As the crucible and its covers are not subjected to overpressure, the design can be made simpler: thinner walls, non-cambered walls and lid, simple lay out of measuring cables are then possible. 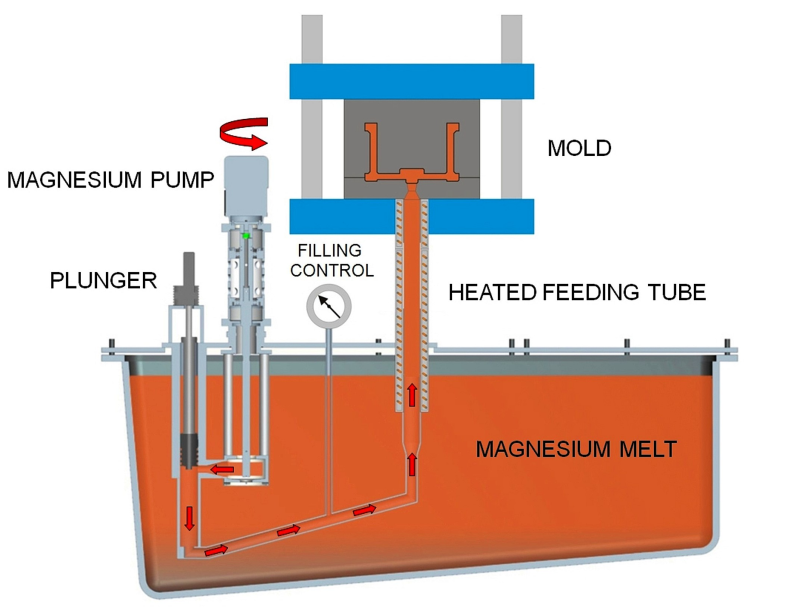 While the melt solidifies in the mold, the shrinkage is compensated for by the final pressure of the melt pump. For particularly long solidification times - e.g. for thick-walled castings - the final pressure can also be applied using a specially designed cylinder with pistons. This process, for which a patent application has been submitted, enables the feeding of the melt into the form by the pump to be blocked by pushing the pistons forward and the desired final pressure to be created with the pistons.